We are delighted to introduce you to Tam Braces, one of our latest 3 1/2" Braces Boys. He is made of deep coral coloured Hembold mohair with a very short, sparse pile. His trousers are made of pale peach German mohair with a longer silky pile length. His pads are peach ultrasuede and his paws are coral coloured cashmere, we have filled Tam Braces with steel shot and so he is nice and heavy for his size. 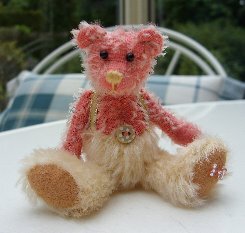 His braces are cream ribbon edged with gold metallic thread, he has a peach coloured stitched nose and shiny black German glass eyes. As you can see, he has a lovely little cream belly button with white polka-dots which tones beautifully with his colours. I hope you like him, he is lovely and his gorgeous colours are sure to brighten your day! Tam Braces costs £39 plus postage. Please note that as with all our bears, Tam Braces is not a toy and is not suitable for children. Sorry - Tam Braces has been adopted.